Tilicho Lake Mesokanta Pass Trekking, most remarkable and awesome journey where Nepal Spirit Adventure and its expert guides will lead you to enjoy this wonderful and exciting adventure. Tilicho Lake Mesokanta Pass Trekking located on high scenic Manang Valley with incredible beauty of Western Himalaya region, this marvelous trek leads on popular and famous Annapurna circuit trail for a week and then heading into remote isolated corner of Manang around beautiful Tilicho Lake, and ending this amazing adventure at Mustang area in Jomsom after crossing scenic high Mesokanta pass. Tilicho Lake Mesokanta Pass Trekking begins with an overland drive from Kathmandu to warm areas of Lamjung district at Syange village by the raging Marshyangdi River. From here our scenic walk starts heading higher towards beautiful Manang valley, trek leads past many lovely traditional villages of Jagat-Chamje-Dharapani to Chame headquarter town of Manang district. After Chame air gets cooler as our walk leads closer to the mountains of northern Annapurna Himalaya, from here on gaining high altitude as the trek head towards dry and barren landscapes after leaving forested area. Walk is on the main trail of Annapurna Circuit to Manang village, this trekking area listed as world top ten destinations by travel magazines and guide books. On reaching at Manang village surrounded with spectacular snow peaks with tour of Braga old and important monastery with ancient artifacts and monuments. In Manang with rest and acclimatization day with time to explore villages of Tibetan Buddhism culture in the great backdrop of Gangapurna-Annapurna II and III. From Manang villages our adventure diverts to Tilicho Lake with mind-blowing scenery of mountains, enjoyable time in Tilicho with its emerald and turquoise color lake, and then our adventure continues to cross above highest point of this trip over Mesokanta-la pass at 5,099 m / 16,729 ft.
After a wonderful moment on top with glorious views downhill to Mustang region at Jomsom town (headquarter town of Mustang district) to conclude this gorgeous adventure Tilicho Lake Mesokanta-la pass trekking. From Jomsom a short scenic flight to picturesque Pokhara city, famous and popular touristic spot in all Himalaya region, located beneath massive Annapurna Mountains with its pristine lakes Phewa and Begnas. Trekking with Nepal Spirit Adventure will be enjoyable with exciting times as our guides are well equipped with vast knowledge to offer you of the area of trek, from culture-geography-history-flora and fauna including medical know-how if needed. Our Tilicho Lake Mesokanto La Pass Trekking departs from Kathmandu. Private treks can be arranged any time of the year. If our set departure dates are not convenient for you, you may choose alternate departures dates. Private treks are best suited for couples, families, work colleagues and small groups of friends. Customized itineraries are available as per your travel needs. 16 Days Tilicho Lake Hesokanto La Pass trek departure weekly from Kathmandu. Private trek can be arranged any time of the year. If our set trek departure dates are not conveninet to you, you may choose alternate departure dates. Private trek is best suited for cuoples, families, wrok colleagues and small group of friends. 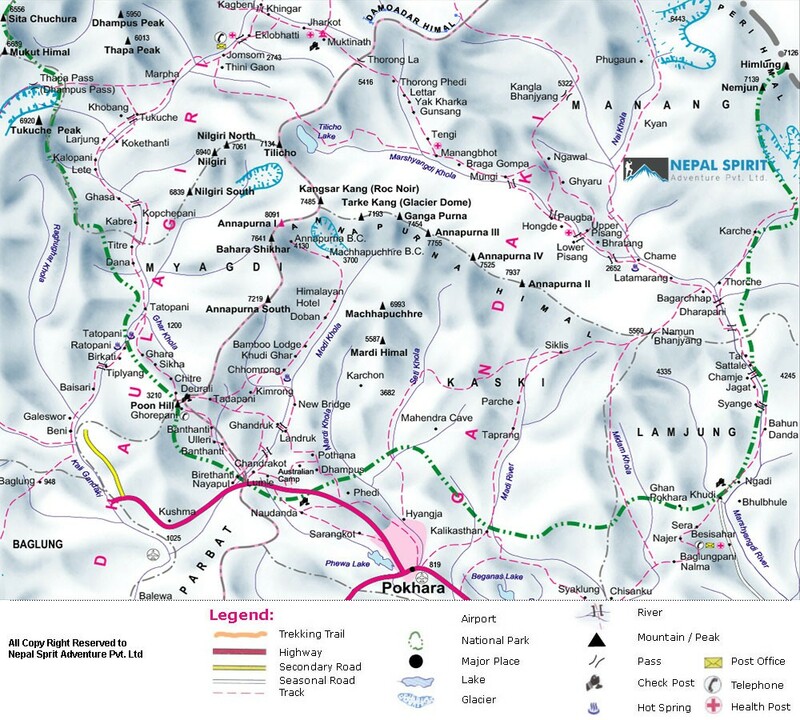 Customized trek itineraries are available as per your travel needs please contact your trekking agency at Nepal Spirit Adventure. Tilicho Lake Hesokanto La Pass Trekking - 16 days is a moderate trek. Travelers who can walk up to 6-7 hours a day on an uphill and downhill trail will find this trek fulfilling. It is best that we prepare ourselves for the trek by jogging and exercising regularly at least a month prior to the start of the trek. Trekking to the Tilicho Lake Hesokanto La Pass Trek should be relatively easier for those who have experience walking/trekking in a high altitude environment. Past hiking experience would be an asset but no technical skill is required for this trip. It is also important that we consult our doctor. Participants with pre-existing medical conditions such as heart, lung, and blood diseases should inform Nepal Spirit Adventure before booking the trek. The best time to trek to the Tilicho Lake Hesokanto La Pass trek is Spring (March to May) and Autumn (September to November). The temperature is moderate in these seasons and guarantees amazing views through the trip. Although this trek can be undertaken during winter, the cold temperature might not be suitable for everyone. Day 01Arrival in Kathmandu (1,315m | 4,314ft) Airport Pick Up Transfer to Hotel Overnight: KathmanduOn arrival in Kathmandu international airport received by Nepal Spirit airport representative with a transfer to respective hotels downtown in the hub of Kathmandu city overnight: Kathmandu. Day 02Free Day in Kathmandu Trek Preparation Overnight: HotelIn Kathmandu free day for individual activities and trek preparations, on this day once can book for half day sightseeing tour at places of interest around Kathmandu-Patan or Bhaktapur cities. We brief details about trekking, introduction trek guide and look up all the necessary trekking equipment. Day 03Drive to Syange (1,140m | 3,740ft) via Besisahar by Bus 6 hrs Journey Overnight: LodgeStarting this wonderful adventure with an interesting overland drive towards Nepal mid west, leading to Beshishar town (headquarter of Lamjung district). From here transfer to another vehicle and continue drive on dirt road passing villages of Khudi, Bhulbhule and Ngadi following the Marsyangdi River upstream. Drive continues through rice terraces fields and villages to Syange a small village for overnight stop in the comfort of nice lodge. Day 04Syange to Dharapani (1,943m | 6,374ft) 6 hrs Trek Overnight: LodgeFrom Syange our walk begins with climb leaving Marsyangdi River behind reaching at Jagat village, a farm village with many lodges for trekkers. After Jagat walk leads on winding path to Chamje, and back at Marsyangdi River crossing to east side into forested area, with super views of Annapurna and Manaslu mountain ranges. As the walk continues reaching a nice village at Tal Besi, from here another 3 hours walk leads to our overnight stop at Dharapani village. Dharapani a nice village located on a junction of Annapurna circuit and Manaslu trekking trail. Day 05Dharapani to Chame (2,720m | 8,923ft) 5 hrs Trek Overnight: LodgeAfter Dharapani walk leads into rhododendron and pine forest passing villages of Bagachap and Danque, then at Timang village with more Buddhist cultured village including views of Mt. Manaslu 8,163m / 26,781ft. From Timang village few hours trek leads to Koto and then to Chame town for overnight stop, Chame a large major town of Manang area and a head quarter town of the district. Day 06Chame to Pisang (3,190m | 10,465ft) 5 hrs Trek Overnight: LodgeFrom Pisang onwards walk leads close to mountains through alpine forests of rhododendron and pine trees, following Marshyangdi River upstream with short ups and down hills to Bhratang village. From Bhratang village walk follows uphill through alpine woodland to Dhukure Pokhari a small place with few teahouses and lodge overlooking Chulu’s and Pisang peak, with possible lunch stop, and then descends to lower Pisang village for overnight stop. Day 07Pisang to Manang (3,540m |11614ft) 4 hrs Trek Overnight: LodgeMorning views of mountains, from here onward altitude gains as the walk leads through forest with short uphill and views of Annapurna II and III, Gangapurna Chulu’s and Pisang peak. Walk downhill to reach flat valley at Hongde village, from here onward tree lines fades for barren, arid landscapes with cold, dry arctic climate. Before Manang, visit old Braga monastery with old Buddhist relics, ancient wall painting and frescoes and stunning views of Annapurna Himalaya, from here an hour walk reaches at Manang village. Day 08Acclimatization Day at Manang Visit Glacier Lake & Monastery Overnight: LodgeA necessary rest day at Manang for acclimatization before reaching higher areas to Thorang-la pass, in Manang short hike around Manang village, this is a large village situated on windswept valley by the bank of Marsyangdi River below Annapurna and Gangapurna mountain range, a nice walk uphill for views of Gangapurna Glacier and Manang glacial Lake. Day 09Manang to Khansar (3,740m | 12,270ft) 4 hrs Trek Overnight: LodgeAfter a wonderful and enjoyable rest at Manang village with its interesting Buddhist culture and traditions, morning walk leads to another highlight of this trip, as our route diverts from the main Annapurna circuit trail reaching one of the last village of Manang at Sri-Kharka through Khangsar on route Tiliocho Lake. Trek leads south-west with fantastic views of surrounding landscapes and snowcapped peaks to reach at Sri-Kharka a small settlement with few lodges after an hour walk from Khangsar village. Day 10Khansar to Tilicho Lake (4,920m | 16,141ft)3 hrs Trek Overnight: LodgeToday a short day walk reaching more barren and arid country, after a short downhill then with uphill over high terrain as altitude gain on reaching our destination at Tilicho Lake. Tilicho Lake regarded as holy place by Hindu's and Buddhist religions, Tilicho Lake blessed with amazing views of surrounding snow capped peaks in the comfort of nice lodges located by the bank of emerald Tilicho lake, after lunch enjoy the magnificent scenery with Tilicho peak, Annapurna III and Gangapurna mountains. Day 11Tilicho to Tilicho Base Camp (4,800m | 15,748ft) 4 hrs Trek Overnight: TentAfter a great time at Tilicho Lake, morning walk continues leading further towards remote corners of Manang valley, as the trek reaches at the base of Mesokanto-La or Tilicho Base Camp, which is the highest overnight camp of this adventure at 4,800 meters high. Overnight camp is set on a meadow with chances of seeing some wild-life like antelopes, musk deer or an elusive snow leopard. Day 12Trek to Nama Phu (3,510) Crossing Mesokanto La Pass (5,099m| 16,729ft) 6 hrs Overnight: TentToday hard and tough day of this adventure, starting early morning to cross two high passes, heading up the high slope traversing high Tilicho pass then with short descend to base of Mesokanta pass, with short rest then climb the last pass of this adventure over Mesokanto-la at 5,099 meters, the top festooned with Buddhist prayer flags, here with mind blowing scenery of surrounding high peaks. After feeling high with tough climb, descend on the trail to Jomsom with overnight camp in a small cattle herders’ temporary shelter at Nama phu. Day 13Nam Phu to Kaisang/ Thinigaon (3280m | 10,761ft) 6 hrs Trek Overnight: LodgeA pleasant and enjoyable trekking today with gradual downhill walk towards Kaligandaki valley with super views of Mt. Dhaulagiri and Nilgiris peaks, after a good walk reaching at Kaisang, afternoon walk leads further towards a large village of Thinigaon for overnight stop, located above Jomsom and Kaligandaki Valley. Day 14Trek to Jomsom (2,725m | 8,940ft) 4 hrs Walk Overnight: HotelAfter a pleasant stop at Thinigaon exploring its unique Buddhist culture, morning walk is easy on the flat river bed of Kaligandaki to reach at famous Jomsom town, the headquarter town of Mustang district with a small airstrip above Kaligandaki River. At Jomsom check into a nice lovely lodge for last overnight stop of this adventure, and celebrate last night dinner among crews and other members. Day 15Fly from Jomsom to Pokhara (9,00m | 2,952ft) Transfer to Hotel Overnight: PokharaEarly breakfast then transfer to Jomsom airport for scenic short flight of 25 minutes to Pokhara, during airborne awesome views of Dhaulagiri, Nilgiris and Annapurna range of mountains with rolling hills and villages, On reaching Pokhara airport transfer to respective hotels by the lake Phewa, afternoon free for individual activities or just relax and enjoy the views of high Annapurna Himalaya peaks. Day 16Drive to Kathmandu by Tourist Bus Transfer to Hotel Evening Farewell DinnerMorning overland drive to Kathmandu after a wonderful time on Tilicho Lake & Mesokanta pass trekking after 5-6 hours of nice scenic ride reaching Kathmandu, then transfer to your hotels with afternoon free at leisure for individual activities and shopping souvenirs. (options of flight back to Kathmandu of 30 mins). Evening we invite you farewell dinner. Day 17 Final DepartureAfter wonderful time on Tilicho Lake & Mesokanta pass with semi Annapurna Circuit trek, including great services of Nepal Spirit Adventure guides and staff, as per the flight time transfer to international air terminal for your departure homeward bound or to next respective countries. The highest height you will reach on this trip is 5099m from the sea level. The walk involves lots of ups and down, takes you through local village, farming lands, terraces and river side as long as you have strength of walking for 4- 6 hours a day, and you are qualified for the trek however you should be having a moderate health and faintness. Nepal has two best seasons to attempt this trek to Tiicho mesokunte la pass, as this trip is a big trip to you, we always recommend you to come at the right time of the year as far as possible.